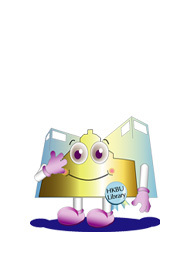 Ever wondered how to illustrate the pride of the HKBU community in a visual way? Contestants took up the challenge to create a new look for the ArtGallery by participating in the Picturing ArtGallery@HKBU Library design competition. All entries showed great creativity, so making a selection was difficult. A jury made up of Mr. Peter Benz (Academy of Visual Arts), Mr. Wade Chan (Digital Graphic Communication) and the Library Senior Management selected 1 winner and 1 runner-up. Both are students from the Academy of Visual Arts. Miss Sonjia Yu Gar Wai, a year 2 student, was selected as the winner of the competition. Her design, entitled "TheBook", consists of millions of dots making up an image of a book representing the history of the University. The design will give viewers a diversity of perspectives from different levels of the ArtGallery. 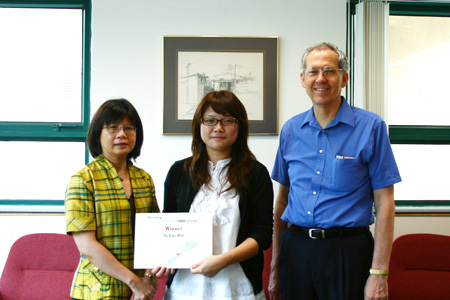 Miss Monica Fu Wing Tung, a year 3 student, was selected as the runner-up of the competition. Named after the old Chinese idiom "Drops make river", her design is a waterfall-like installation symbolizing the collective achievements of the University. The new design will be launched during the First Semester.